Which is your favorite buster armor? 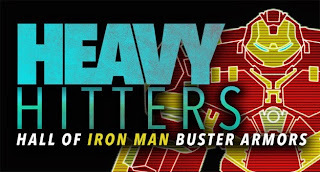 That Galactus Buster has to be huuuuuuge! I'd want to see him fight Optimus Prime or Megatron with it. The one in the movie was pretty sweet. The Galactus one is cool. I'll admit the Galactus Buster is pretty sweet. But I'm still waiting on Tony to design the Busta Rhymes Buster. Iron Man versus The Transformers! Back when Marvel had the comics rights to The Transformers it either probably happened or could have happened. The movie version would be fantastic. I remember Spider-Man in the Transformers comic but not Iron Man. That would have been cool. Much the same with me. I remember Spiderman, but I could have sworn the X-Men got involved at some point. I know the original Death's Head did as well. If Iron Man didn't get involved, then that was a missed opportunity for sure.